Meanwhile, Commander of Khatam ol-Anbia Air Defense Base Brig. Gen. Farzad Esmayeeli announced that the entire air defense units, including those of IRGC, participated in Mesbah Al-Hoda drills. “The air defense system is in the frontline of defending the country by utilizing indigenized equipment,” said Gen. Esmayeeli. The Mesbah Al-Hoda exercises were the first large-scale military drills in recent years that had not been publicly advertised in advance or during the exercises for show-of-force purposes, and today’s announcement by the air force was unusually modest, absent of any hyperbole and no reference to regional and global enemies of the Islamic Republic. The Iranian military seems to have decided not to interfere with the on-going diplomatic initiatives of the government. 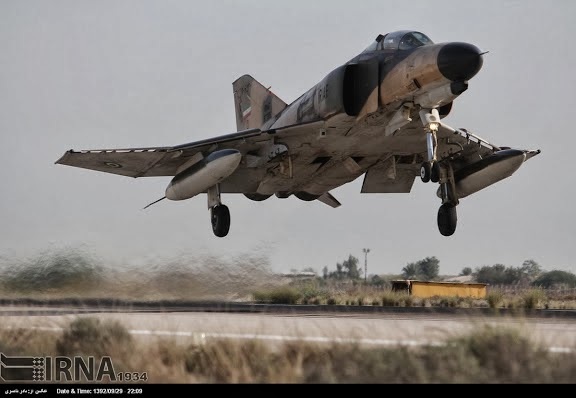 Gen. Nasirzadeh also announced that the Iranian air force will conduct joint maneuvers with the country’s other military branches in the coming Persian new year (which starts on 21 March 2014). He did not provide any further details. Last December, the IRIAF wrapped up its annual wargames over the Persian Gulf, codenamed Fadaeeyan-e Harim-e Vellayat IV. During those drills, the IRIAF successfully test-fired air-lunched cruise missiles (ALCMs) fitted on F-4E Phantom II fighters, the Qader and Nasr cruise missiles. The ALCMs give the military the capability for hitting targets much farther than before. Currently, the air defense branch has been implementing 9 months plan to convert the S-200 system to a mobile version. IRIAF exists only on paper and most of the aircraft are now pushing the end of their airframe life. What the idiotic mullahs need to do is pursue some sort of half way decent diplomacy and try to get some Russian Sukhois or upgraded MIGS. Iran today has the weakest airforce in the world for a country its size. The only effort the corrupt mullahs have made is in their self-survival, rather than Iranian national interest. FNA had reported the conclusion of this drill four days ago, on 28 January 2014. See HERE. To my knowledge, no photos or videos have been put forth by Iran's media. The (mullahs) are not idiotic...., and it is that the zionists and their supporters run ultimately for their perdition !! The current Supreme Leader of the Islamic Republic will be described by history of the world, as the most skilled leader and politician of modern times, and other zionist leaders and their supporters as mediocre idiots of their times. The leadership of Iran and Russia try to implement idea, that the best cure for the problems is to overcome it, with a help of time passages. Imagine, what would happen if Russia would deliver the S-300 too soon, and before upgrading and strenghtening her and Iran's positions.....? Therefore, the delays and consecutive time gains benefit Russia and the Islamic Republic too. A right time will come, where Russia will have to transfer aviation technologies to Iran as to a potential ally in defense of both countries. Interesting, the "most skilled leader and politician of modern times" only needs Russia's S-300 to prove his greatness! Why no photos or videos were released this time? To keep a low profile? They have not announced the Velayat's annual naval exercises either. Did they scrap the IRIN's major drill or choose not to report on it? USKOWI ,you are quoting him out of context! @-ANON 'the Mullahs are not idiotic'- MAY God BLESS YOU -indeed you are hitting a point home ,well said !. Why is it out of context? Delusion recognizes no bounds! May you come back to real world soon. Yes you are right,millions of Iranians are "supporters" of the "zionists" because they don't agree with the sub-human behaviour towards them by the terrorist regime occupying Iran. Anon 8:40 AM, millions of Iranians are not supporters of zionists because they don't agree with people who label others as "sub-human" and operate a regime that commits state terrorism and settler-colonial occupation. If you had any sense you would have realized that what I meant was in sarcasm. When I said, Iranians that want freedom from Islamic terrorist regime are branded as "supporters of the zionists" by elements of the sub-human regime. Notice I said the criminal IRI regime not "others". But then you went into your usual and irksome diatribes comparing an issue of no relevance to Iranians and their daily bread. It was not my comparison. That was already made by you in the post of February 3, 2014 at 9:43 AM. Anon 6:27 AM....Give it a rest man! You are some paranoid person. It is true, and the zionist in israel and the ADL, hired great numbers of volunteers, students and even "unemployed", with some compensations, to invade blogs and forums to post their lenghty and "blurring opinions", in order to promote their cause and ridicule others, including mocking and slandering of their adversaries. But the Islamic republic also hires and uses "Internet Solders" known as "Cyber Mozdors" and "Cyber Basiji's" to invade forums with their useless chatter. Anon 8:00 PM, does that it better for zionists to do it? Anon 8:00 PM, does that mean it is better when the zionist occupation does it? of what type of wood will the new plane be constructed?